How Much Does a Medical Malpractice Lawyer Cost? What Are My Chances of Winning? Learn the results of our survey on real-life experiences with medical malpractice claims, including how much attorneys charged and factors that affected the likelihood of receiving a settlement or court award. If you’ve suffered harm because of a mistake by a doctor, hospital, nurse, or other health care provider, you might be wondering whether it’s worth it to file a medical malpractice claim. That brings up other questions, including your chances of success, whether you can afford a lawyer, and whether an attorney will take your case. To learn more about real people’s experiences with these cases, we surveyed readers across the United States who had medical malpractice claims. Here’s what they told us. 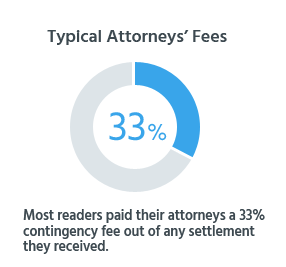 Nearly all (92%) of our readers who hired attorneys had a “contingency fee” arrangement—meaning that their lawyers agreed to represent them in return for a percentage of any out-of-court settlement or award they won after a trial. The most common contingency fee percentage our readers reported was 33%. Our survey confirmed what many lawyers in this field will tell you: It’s very difficult to win medical malpractice cases. Overall, only 12% of our readers were able to get a payout in the form of a settlement or court award. But when we look more closely at the survey results, it becomes clear that some people were able to improve their chances of success: Nearly two in ten (17%) of readers who hired a lawyer received a settlement or award, and three in ten (30%) got a payout after they sent a “demand letter” to the insurance company and/or filed a lawsuit. 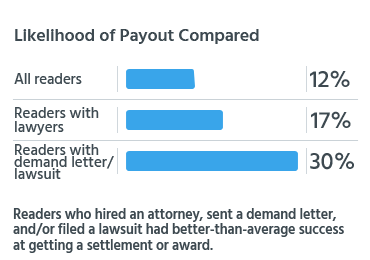 When we directly compare those who did or did not take these steps, the results are more striking: Hiring an attorney almost doubled the chances of getting an award or settlement (only 10% of those without a lawyer received a payout). Sending a demand letter and/or filing a lawsuit more than tripled the odds of success. All of this makes sense. Medical malpractice claims are very complicated and difficult to prove. Not only do you have to meet particularly strict requirements for showing that you were harmed because the health care provider didn’t meet the appropriate level of medical care, but many states also impose tight time limits and other special procedures in these cases. It can be especially hard to overcome all of those hurdles without the help of an experienced medical malpractice attorney. Also, readers who were pursuing their claims without an attorney’s help may not have known to send a demand letter and may not have understood all the requirements for filing a medical malpractice lawsuit in their states. 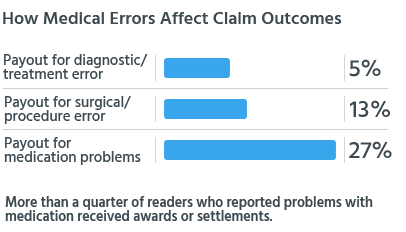 Our survey also showed a big difference in outcomes of medical malpractice claims depending on the type of medical error that readers experienced. Of the most common medical mistakes that readers reported, the odds of receiving a payout were highest (27%) for those who experienced bad reactions or other problems related to medication, and lowest (5%) for those who said they were harmed because of misdiagnosis or delayed diagnosis and treatment; 13% of readers who reported mistakes during medical procedures received payouts. How Hard Is It to Find a Medical Malpractice Lawyer? Having an experienced medical malpractice attorney can help you gather the evidence and find the expert medical witnesses you’ll need to support your case. And contingency fees can help you afford a lawyer, because you generally won’t have to pay attorneys’ fees unless and until you receive a payout. To help even more, lawyers will sometimes advance the costs of pursuing a case, including the steep fees for those expert witnesses. But these arrangements—along with the general difficulties of proving these claims and state laws that limit medical malpractice payouts—can also make it hard to find a lawyer willing to take your case. Attorneys will only accept cases when they believe they can win a settlement or award that’s high enough to be worth the risk and expenses. Given all of that, it’s not terribly surprising that only 11% of our readers were able to hire attorneys to handle their claims. While that’s discouraging, one other survey result may offer a ray of hope. 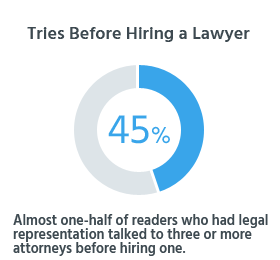 Nearly two-thirds (63%) of our readers with lawyers said they talked to at least two attorneys before hiring one, and nearly half (45%) tried three or more lawyers. Persistence does seem to pay off—or at least help. For more details on our survey results, see this page on compensation and duration in medical malpractice cases.